The dominance of Dean and Son continued for most of the nineteenth century. However, in the 1880s and 1890s several novelty book makers began to make waves the market. This is mostly due to German artists, who invented and went on to excel in the technique of chromolithography. Fl�gel, Karl Friedrich. Floegels Geschichte des Grotesk komischen, bearbeitet, erweitert und bis auf die neueste Zeit fortgef�hrt. Leipzig: H. Barsdorf, 1888. This book contains one movable plate, which is an example of �metamorphosis,� or changes made by flipping parts of the picture. The three figures are of puppets whose costumes change to reflect different characterizations. In 1870, his sons joined him to open a publishing business in London. Their productions included special paper items such as cards, puzzles, and paper dolls. Before Raphael Tuck's retirement in 1882, he became a British citizen and the official Publisher to Queen Victoria. The Tuck firm helped to perpetuate Raphael Tuck's amiable disposition by the publication of children's books under the title Father Tuck. Its contribution to movable books occurred around 1890 with the publication of Father Tuck's Mechanical Series. The books in this series featured several different movables. One type was similar to those in Dean's scenic books in which the movables unfolded to reveal multi-layered, three-dimensional scenes. Other books contained pull-the-tab and peep-show mechanisms. Tuck & Sons produced another series of movables, each featuring overlays designed to be raised out from the pages, thereby giving scene with a three-dimensional effect. 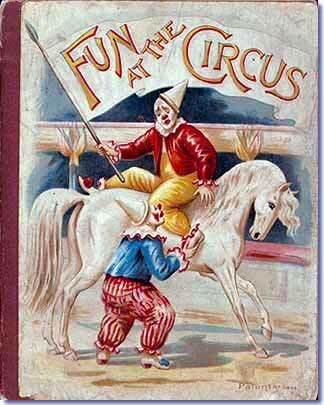 Fun at the Circus is an example of this technique. The books from this series were popular and available at inexpensive prices. They were issued both in color and in black and white (to be colored by the owners). Fun at the Circus. London; Paris; New York: Raphael Tuck & Sons, [ca. 1900]. Sadly, in 1940 the Raphael House was bombed in the blitz of London, and the records from the Tuck business were destroyed.